Alright, I combined the elements from all 3 crowns as suggested. I have also attached a mock-up on Dylan’s linework for Dlone Kynazarr so that you can see how it fits with feel of the characters. If this layout/crown is approved I will get into the final treatment of the type and the reworking of the crystal for the icon. Also lets have a phone conversation about the final treatment of the type. I am on board with the crown 100%, I like the result of having combined them. The type looks great with the Mockup of Kynazarr as well. I approve this layout but I agree we should have a phone conversation about the final treatment. Nice work. 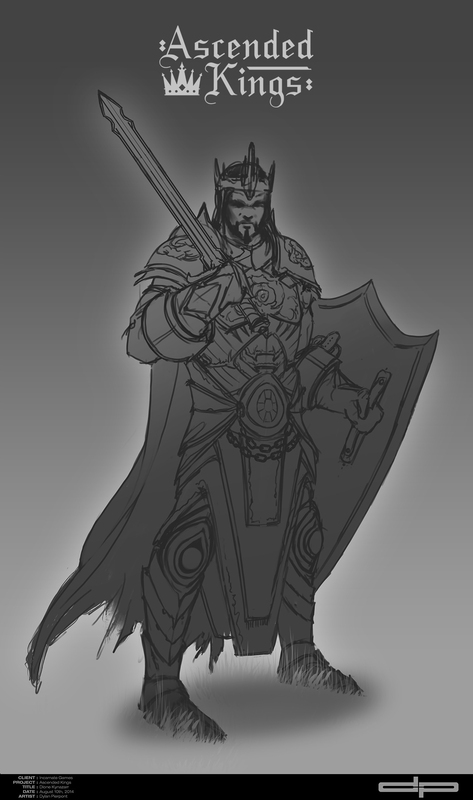 Stay tuned for EPISODE # 015: Ascended Kings Logo Concepts 3 which will be posted soon!